Paul est le fils de Jean et le petit-fils de Marc. Paul is Jean’s son and Marc’s grandson. We’re exploring the French words for family members. To learn words for more relatives, click here. Take our quiz on family members to find out how many you know. Les écureuils peuvent sauter de branche en branche. 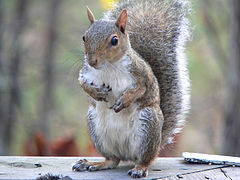 Squirrels can jump from limb to limb. Our word is one of many examples of French words for animals and pets. Find out how many words you know about animals by taking our Animals Quiz. Le hockey sur glace se déroule sur une patinoire. Ice hockey is played on an ice rink. Il se fait tard. On met les voiles? It’s getting late. Shall we leave? Il a été témoin d’un vol sur le métro. He was witness to a robbery on the subway. Our word is among those we’ve posted about society. Try our quizzes on Police and Crime and Courts and Law to test yourself on similarly themed words. Our word is one of many about shopping and fashion that you can discover on our site. Our word is inspired by life in the city, la vie en ville. For more words about the workplace, click here. J’ai mal à l’estomac. Je ne mange rien. I have a stomach ache. I’m not eating anything. Je te jure, je n‘ai rien dit. I swear to you, I said nothing. Rien n‘était prêt à manger. Nothing was ready to eat. Our example is one of several negative expressions in French. To see more common examples, click here. Test yourself on today’s phrase and others about negation in French here.